Eight months ago when we started this blog, we had no idea how much it was going to open our world to such a great community of like minded crafty folk! We started out just wanting to upgrade from the daily picture text messages we were sending each other, to a forum where we could share our passion - and lets be honest, give each other better quality eye candy to drool over. Now more than 100 posts later (this marks the big 101), we can honestly say that this has been an amazing experience and while we always hoped someone would read our little blog posts besides each other, neither of us ever expected to make such great quilty friends, let alone be nominated for a blog award! 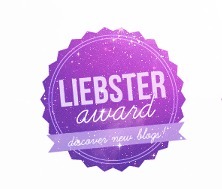 Imagine our surprise when perusing Adrianne's fabulous blog to see our little web space nominated for the Liebster Award. Thank you, thank you, thank you! 2. Answer 11 questions asked by the person who nominated you. 3. List 11 things about yourself. 4. Nominate 11 of your favourite blogs that have less than 200 followers. 5. Ask your nominated bloggers 11 questions. This is going to be one long post! 1. What is the first quilt you made like? If you have a picture - please let us see! 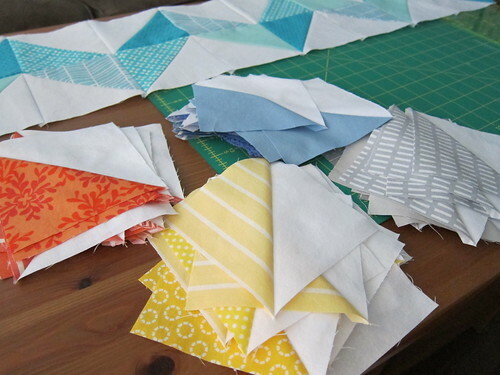 Kelsey: I've spent quit a bit of time over the past few months reflecting on how the making of one simple baby gift morphed into quilting becoming a fundamental part of my life. The first quilt I ever made was a bento box shortly after I found out I was about to become an auntie. I posted the story and some photos here if you want to check it out. Amanda: I bought the fabric for my first quilt back in high school. I decided I was going to make a twin sized Around the World Quilt in shades of purple. Armed with some newspaper (for templates) and a dull pair of kitchen scissors, I began cutting squares. You can probably guess that I never actually finished that quilt but it is still sitting in my WIP pile so I might get to it eventually. My first finished quilt was back in 2008 when one of my close friends had her second baby. It was a simple whole cloth quilt. 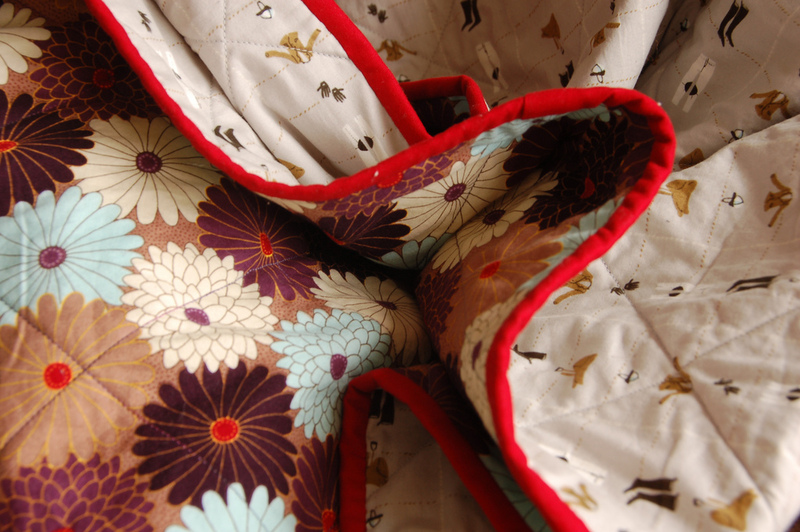 A yard of fabric on the front and a yard on the back, machine quilted in a diamond pattern. It was simple but cute. 2. What is your favourite part of making a quilt? Amanda: My favourite part of making a quilt is cutting the fabric. I love sitting in front of a movie with my cutting board and slicing up all of my lovely fabrics. The thrill of starting a new project combined with the pinpoint accuracy involved in making neat stacks of fabric really do it for me (it could also be elation at the fact that I now have a rotary cutter and cutting mat instead of newspaper and dull kitchen scissors to help me with this step). 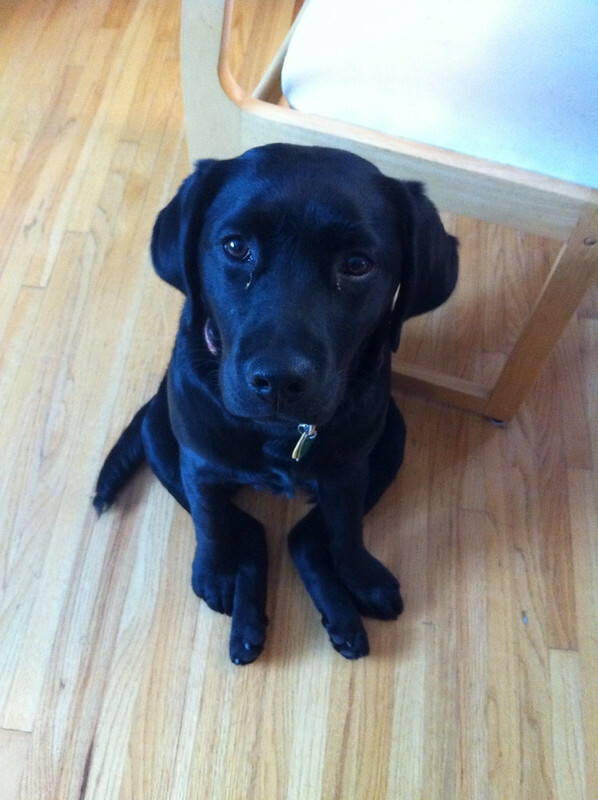 Kelsey: in December 2011 I surprised my husband with an early birthday/Christmas gift - a beautiful black lab puppy. 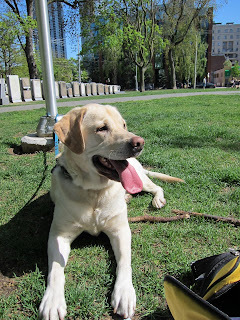 I had never owned a dog before, but he grew up with a lab and had really wanted a dog of his own. I wasn't completely sure what I signed up for but I've been smitten with her since that first day, and now can't imagine life without Aveta. I also have a 9 year old cat that would snuggle 24/7 if she could. Amanda: I married into pet ownership. My husband had a sweety pie yellow lab named Bowser before I met him (actually Bowser was the reason we got together in the first place). He's such a sweet boy, charms everyone he meets! 4. What would your karaoke song be? Kelsey: I'm a dreadful singer so hopefully no one ever has to live through me singing karaoke! With that being said though, I admit that I can't help but sing along with loud music in the car. Amanda: I love all quirky and fun music. Anything from twangy country to upbeat pop to Hawaiian folk music. Pretty much anything that will boot up a classic living room dance party. It all just depends on my mood. My best karaokee also happens in the car. 5. Have you ever been to a quilting conference or retreat? Kelsey: I haven't yet but would absolutely love to soon! Amanda and I have been tossing around the idea of Sewing Summit 2013, so hopefully that comes into fruition. It would be SO great to meet some bloggidy friends in person. Amanda: I've been to some pretty awesome knitting events but nothing quilting related. Ask me again in a year, hopefully I'll have a different answer. 6. Who in your non-quilting life knows you have a quilt blog? Kelsey: My mister and a handful of very close friends. Amanda: The hubs (a.k.a. technical advisor) and maybe two other people (although only my husband knows the URL). 7. What is the strangest search term you've seen in your "Search Keywords" stats? Amanda: I'm going to say "61 days". I'm not exactly sure what a person might be looking for when those are their search terms or how that would bring them to our blog. 8. How did you choose your blog name? Amanda / Kelsey: We both have pretty chaotic lives, and more often then not, it feels a bit like our lives are a jumble of frayed bits and pieces. After a hectic day we love nothing more than coming home to make a beautiful pile of frayed fabric. One way or another, it's a fray everyday here. 9. Are you a member of a real-life quilt guild? Kelsey: I recently joined one in my home town but I always seem to be out of town on the meet up days. Fingers crossed for this months meeting! Amanda: I'm currently in the process of moving (closer to Kelsey). I've been scoping out the guilds in my new home so hopefully after the move I'll find one to join. 10. What is your favourite sweet treat? Kelsey: Coke flavoured slurpees from 7/11! It might be cold in Canada in half the year, but on a hot day, nothing beats a slushy treat. 11. Do you like to have something to listen to while you are quilting - like the TV, music, an audiobook? Kelsey: I love watching tv series when I quilt! Mad Men and Downton Abbey were my previous obsession, and now that I'm all caught up, I'm moving on to Pretty Little Liars (thank you Netflix!). Amanda: I have a bit of an obsession with CBC radio and pretty much spend all of my waking hours listening to it. My favourite program right now is about advertising and is called Under the Influence. You can stream it or download episodes from iTunes. So convenient for me since I'm almost never home when it actually airs Saturday mornings. Neither on of us has a sister, which has resulted in each of us upgrading the other from cousin status to sister status. In elementary school Kelsey's oldest brother, Scott, once conspired with Amanda to convince Kelsey that their parents had traded the girls as babies - because Scott and Amanda look way more alike. Kelsey believed them for longer that she'd like to admit. Neither of us care for cooking but fortunately we both married husbands who are extraordinarily chef-like in the kitchen. Baking is way better, and more delicious too! When dinner is not being provided by our spouses, we both agree that yoghurt, popcorn, and peanut butter on a spoon are acceptable substitutes. Collectively we've travelled to 23 different countries from various regions including, North and Central America, Europe, the Middle East, and Africa. Within the next month that total will raise to 27 as we both have winter vacations lined up. We love to travel...a lot! Even though we only get to see each other once or twice a year if we're lucky, we have so many of the same mannerisms it's scary. We both live in big cities now, but spent our childhood in small communities. Though we listen to all types of music, we both have a soft spot for twangy country tunes - Garth, Shania, Tim? bring 'em on! We come from a long line of crafty women. At family functions, it is not unusual to see three generations working on their WIPs. Kelsey has always been into team sports: basketball, volleyball, ultimate frisbee, while Amanda is more of a solo sport kind of gal: figure skating, riding, skiing, swimming. We both have perfectionist tendencies even when the time required to make it just right far outweighs the importance of it being just right. Kelsey's closet is organized by type of clothing in ROYGBIV colour order. Amanda's closet has more of a "choose your own adventure" approach to clothing organization. Blogs We Love and Nominate! Alia of card table, inc.
What style of fabric do you tend to gravitate most towards, and are they often fabric lines from the same designer? What was the first quilting blog that you remember stumbling upon? Have you ever kept a quilt for yourself or are they always gifts? What is the most sentimental quilt project you've ever worked on? Are there any colours that seem to find their way into every project you make? Do you have any other crafty talents besides quilting? Where will you spend your next vacation? What is the best and worst gifts you have ever received? Thanks so much for nominating me, you're too sweet. :) I'm actually at 300 followers, so I'm going to decline, but I'm touched that you find my blog worth sharing about! I'm enjoying following along with your blog and look forward to what comes in the future.